As hot rollers and wash & sets continue to make a huge come-back in the beauty world, questions about rollers have been increasing as well. We can totally relate to how overwhelming it is to shop for rollers — there are so many different types, textures, and materials! So, we’ve taken all of your questions into consideration and decided that the easiest way to answer them is by creating a how-to buying guide for every type of roller we could think of! We’ll break it down by texture, material, and type of roller by curl type. Texture: When it comes to the texture of the roller, there are two main types you will commonly see – ribbed or flocked. Below you’ll find a miniature description of the textures and how they differ. Ribbed rollers are definitely the more preferred texture. They provide grip for the hair without changing the material of the roller. There’s typically 2 ribbed sides of these rollers that help hold the hair on the roller by sticking out and allowing hair to fall between the ribs. Because they do not add any additional material for gripping the hair, the hair will release from these smooth plastic rollers without any resistance or pulling. Flocked rollers have an additional piece of material around the entire center portion of the rollers. The material is a velvety, felt like material that grips the hair and acts as a non-slip cushion. This texture works best when using large rollers for mainly volume. If you were using them to achieve curls, the hair would likely need to be wrapped around the roller several time which could then become very difficult to remove, leading to tangles and discomfort. Sponge rollers, often use steam to achieve curl, like Caruso Rollers. This leaves you with super shiny curls in about 10 minutes with absolutely NO heat damage. This is perfect for fragile hair or any other hair type trying to achieve curl and volume. Ceramic rollers use ionic/far-infrared technology to infuse hair with shine by sealing the cuticle while setting the hair. This is a great option for anyone with damaged or fizzy hair as sealing the cuticle seriously cuts down on frizz. Nano-Titanium rollers generate far infrared heat that eliminates hot spots to provide maximum heat transfer evenly throughout the rollers. Because of this, this is the perfect roller for anyone who is trying to achieve loose but somewhat spiral curls and volume. Titanium rollers are great for all hair types and are very helpful for thick, resistant hair! Wax Core rollers are perfect for those who have curl-resistant hair. Wax, being a dense more rubberized material, has the tendency to grab onto heat and hold heat for longer periods of time — making it perfect for people who have trouble getting their curls to set. This is also an excellent option for those with really thick hair, allowing an extended heat time to help penetrate through thick locks! Type: once you’ve narrowed down the texture and material, the rest is simply picking the right type of roller for the amount of styling time you have or curl type. Heated rollers: These are those that would include all of the materials mentioned above – ceramic, titanium, wax-core and steam rollers. All of the mentioned rollers are available in a variety of diameters – the larger the roller the smaller the curl. Larger diamaters will give you more volume and smaller diameters will give tighter curls. All of the mentioned materials, with the exception of the steam rollers, come with an electric base that heat the rollers so they are ready to use right away and are typically done setting in less than 5 minutes. When using steam rollers, each roller must be “steamed” on the unit individually for 3-5 seconds then once all the rollers are in your hair, the hair must left to dry for about 10 minutes but produce absolutely no damage to your hair. 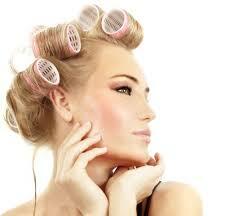 All rollers, however, and less damaging to hair than curling irons. Magnetic rollers: These are plastic rollers that are to be used on wet, freshly washed hair and set in place with magnetic counter piece for easy hold with no pins or clips. The hair should be dried under a dryer or by air drying and will provide much longer last results than heated rollers. Mesh rollers: These are a light weight plastic that is designed to mimic mesh and are applied to wet, freshly washed hair. They are super smooth and allow hair to dry quickly under a dryer or by air-drying because of how easily air can circulate through the hair. These require being pinned in place with roller pins but will also provide much longer last results than heated rollers as well. Foam rollers: These are designed to be used on clean, dry hair and either slept on or set under a dryer and left to cool. These are a gentle way to wake up to gorgeous volume without the tight curl that wet-hair rollers will give you. Velcro rollers: As seen in the image above, can either be used on damp, towel dried hair or dry hair in the same way as magnetic rollers or foam rollers. These are great for thin, fine hair which leads to less breakage since there is not a need to use pins or clips – if you have thick hair, you may still need to use a clip to pin the roller in place. Velcro rollers leave you with soft, loose curls and tons of volume. Flexi-rods AKA Twirlers: These are a long rod made from a foam-like material that is flexible and requires no pins or clips. These can be used on wet, damp, or dry hair and set overnight and bend to hold themselves in place. These give you a similar but longer-lasting curl result as a curling wand or hot sticks. We hope this helps narrow down your search! ← How to Create a Faux Bob at Home!